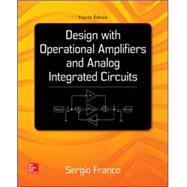 Franco's "Design with Operational Amplifiers and Analog Integrated Circuits, 4e" combines theory with real-life applications to deliver a straightforward look at analog design principles and techniques. An emphasis on the physical picture helps the student develop the intuition and practical insight that are the keys to making sound design decisions.is The book is intended for a design-oriented course in applications with operational amplifiers and analog ICs. It also serves as a comprehensive reference for practicing engineers.